Red Bull have released images of the cockpit head protection design they believe Formula 1 should adopt. Governing body the FIA is pressing ahead with plans to introduce in 2017 a so-called "halo" device, which was tried by Ferrari in pre-season testing. 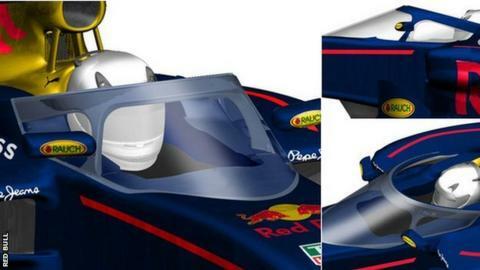 But Red Bull believe that their design, which features two side support pillars rather than a central one in addition to a screen, is preferable. FIA F1 director Charlie Whiting said he had "doubts" it would be ready in time. The halo design is already in the 2017 regulations, which are close to being finalised and also include a redesign of the cars to make them faster and more dramatic looking. The vast majority of the drivers are in favour of adopting increased head protection for 2017 after a series of fatalities across motorsport from head injuries sustained by objects colliding with a driver's helmet. Red Bull team boss Christian Horner said they intended to test the plan in April. However, it is some way behind the halo in development terms, which is soon to undergo a final risk assessment process and other checks on aspects such as driver access and egress before the design is finalised by the end of May. Whiting said at the Australian Grand Prix: "It's been tested quite extensively now, and I think it will offer very good protection for a flying wheel, for example, that's the main way it's been tested so far. "The Red Bull [idea] is an alternative to that. It's considerably further behind in development, it's never been tested, but it could offer additional protection. "But I've got my doubts that it could actually be implemented for 2017, whereas I think the halo could." He said the FIA would not delay plans to introduce of head protection in 2017 if an alternative design was emerging. "We are on a course for the halo," he said, "because that has been tested thoroughly, and we feel it offers the best all-round protection."